Did you even get it? Sometimes, if signature is not required they'll have the driver of the delivery vehicle sign, just to release it. 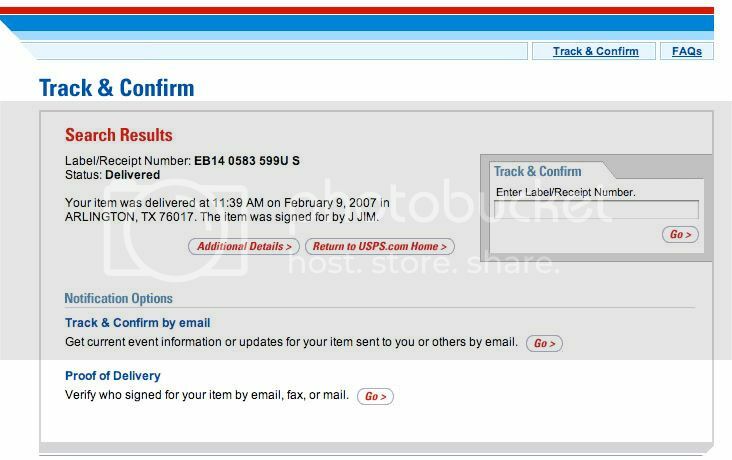 This was USPS Express mail..
edit by eeun: Tom removed posted images of your private information - namely a scan of your license - so it's only appropriate you not post the private address of other Applefritter members. It's also up to Reverend Darkness to pursue removal of his private information from your Photobucket account. I got the receipt. Now, if you would be so kind as to NOT POST MY ADDRESS ON THE INTERNET, I'd really appreciate it. Notice of further returns should be sent directly to me. Upon notification that an item has been returned to its owner, I'll contact that person, confirm receipt, and post here.